If you’ve read my last two posts you’re familiar with the concepts of hip and knee dominance and understand that over-50 adults and seniors should cultivate hip dominant movement. Hopefully you’ve grooved an error-free Wall Hip Hinge Pattern (WHHP), so you’re on the way to making hip dominant movement automatic and instinctual. Maybe you’ve felt confident enough to apply the first two progressions: 1) moving your heels away from the wall; and 2) adding a postural challenge via the Prisoner Position. The basic parallel stance WHHP covered in the last two posts will only get you so far, so this post I’ll kick it up a notch and cover a progressive version of the WHHP I call the Split Position or Kick-Stand WHHP, which emphasizes placing much of your body weight on one leg. 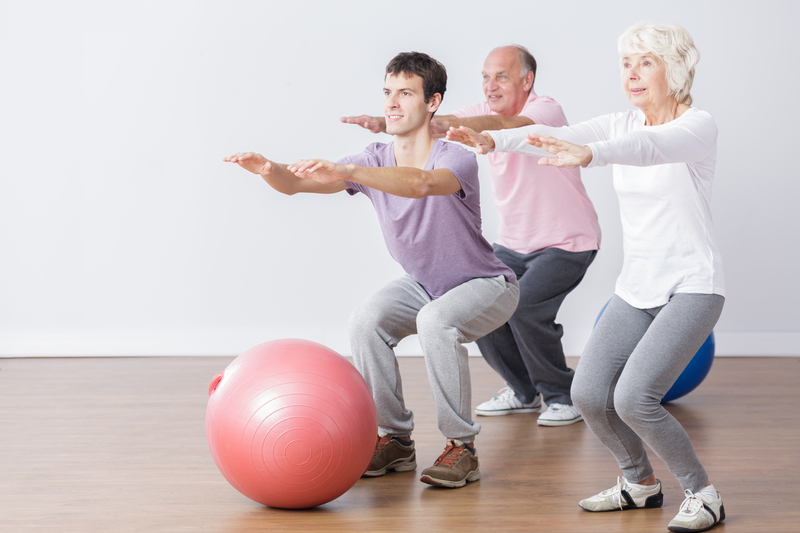 This new position is important for over-50 adults and seniors because full functional fitness can be realized only with the ability to stabilize, move and balance on one leg. The Kick-Stand WHHP gives us a basic method to safely initiate hip dominant movement one-leg-at-a-time. A quick caution: the Kick-Stand Position WHHP is a challenging step up from the standard parallel stance WHHP and is not for everyone. If you have issues with hip stability or lower body strength or standing balance this new WHHP progression is not appropriate for you right now. What’s so important about being movement-comfortable on one leg? For starters, walking is one of the most basic functional activities and much of the walking cycle is spent on one leg, so improving movement quality on one leg can often translate to improvements in walking performance in general and steadiness on one’s feet in particular. Confident single-leg movement ability also translates directly to other functional activities like climbing and descending stairs/steps and, importantly, can reduce the risk of falling, which is a top cause of functional loss, increased disability and even death. One reason seniors fall is because they can have a harder time picking up their feet, which makes tripping or stumbling more likely. One potential reason for a low foot ground clearance is what I call “lazy hip”. “Lazy hip”, as I’m using the term here, is the inability of the hip muscles to hold up the pelvis during the phase of walking where only one foot is on the ground. If the hip muscles can’t hold up the pelvis, it tips down and causes the foot of the swinging leg to have a lower ground clearance. Learning to stand, stabilize and move on one leg is the most direct, efficient and functional way to facilitate the hip muscles to activate appropriately during the swing phase of walking to improve and prevent “lazy hip”. There are many other examples of why good functional ability on one leg is an important priority. Have you heard of the popular fitness term “core work”? Many people think of the core as synonymous with the abdominal muscles, but this is highly inaccurate. The functional “core” really denotes everything from the shoulder blades down to the pelvis/hips. When you spend purposeful time on one leg you are performing usable core work in a highly functional position. What I mean by “usable core work” is that it translates well, and carries over to, functional activities of daily living! The main thing to understand about the Kick-Stand WHHP is that, other than holding one leg in the kick-stand position, proper performance is exactly like the standard parallel stance WHHP. With the exception of the kick-stand leg, your body should be positioned, start, move and finish as described in the previous two posts. Contraindications*: Issues with hip stability, lower body strength, balance or significant pain or discomfort. Precaution: Balance/stability! If you have any doubts about staying safe and stable on mostly one leg, don’t try it. Prerequisites: Consistent error-free performance of the standard parallel stance WHHP and the ability to perform the first two progressions error-free. Kick-Stand Position: Shift your weight to one leg (the support leg) and place the heel of the opposite leg (the kick-stand leg) even with the tip of the toes of your support leg. Ideally, the kick-stand leg should have a straight knee and the toes off the ground for the whole movement cycle of the Kick-Stand WHHP. If you have really tight hamstrings (back of the upper leg) keeping the knee of your kick-stand leg straight may be a challenge, so don’t fight it too hard, just let it bend a bit. Start Position: Initially, your support leg heel should be very close to the wall – no more than 3 inches. You can always move your heel further away when you’re sure you are stable and you become comfortable with the Kick-Stand WHHP. Side-To-Side Asymmetry: It’s common for one side to be easier or harder than the other and you have to treat each side as a separate case. It’s important that you devote special attention to improving the harder side as this will yield improvements in balance, confidence and functional ability. If you have a significant right-left asymmetry, stop working on the easier side almost completely for a while and spend most of your time and energy bringing the harder side up to parity. Common Errors: All the errors outlined in my last post are possible. The most common, by far, are: 1) the support knee thrusting forward; and 2) the support knee moving laterally inward toward the kick-stand leg so the knee tracks inside the ankle as viewed from the front. Again, your basic parallel stance WHHP should be completely free of these two errors before you attempt a Kick-Stand WHHP! Error Number 1 is relatively straight-forward to correct with a chair/bench barrier as described in the last post – but be careful with this strategy as you are now mostly on one leg, so potentially more unstable. Error Number 2 is harder to correct on your own without professional help, but the strategy is: 1) first start with your support leg heel even closer to the wall; 2) then, as you initiate the hip hinge, focus on pushing your support knee laterally away from the kick-stand side while keeping your support foot flat on the floor. Keeping the support foot flat on the floor is very important because many people push their body’s weight to the outside edge of their support foot when pushing the knee out laterally, which creates an unstable base of support. Additional Error: An error I sometimes see with the Kick-Stand WHHP is rotation of the hips and/or the upper body – most often the kick-stand side rotates toward the support leg side (see photo). If you note this movement error, please back up your support leg heel closer to the wall until you can groove the pattern without any rotation. 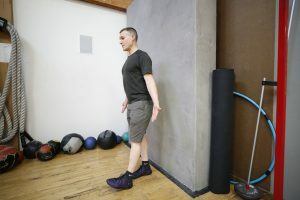 Progression: Gradually moving your support foot heel away from the wall to generate greater range of motion for the hip hinge without sacrificing proper form.